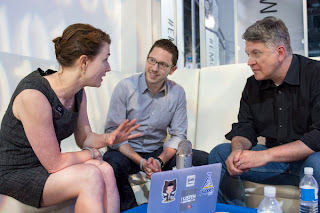 This past week we sat down with The Geek Whispers podcast team (Amy Lewis (@commsninja), John Troyer (@jtroyer), Matthew Brender (@mjbrender)) to talk about how we created The Cloudcast (.net) and the behind-the-scenes details on how the sausage factory actually works. It was somewhat of an Inception moment to be talking about the making of podcasts on a podcast, while podcasting with podcasting people. Their podcast focuses on the intersection of Enterprise Technology and Social Media and they do an excellent job highlighting how the technical community can better leverage the various aspects of social media to enhance careers, build networks and improve their companies. We highly recommend adding the show to your regular podcast listening lists. We've spent many hours listening to John Troyer's VMware Community Podcast and he's given us great insight into how to build community and how to streamline podcast production. John has built a community that is incredibly passionate about VMware technology and sharing with others - easily one of the best in the entire industry. Amy Lewis has been a guest, co-host or host of many episodes of The Cloudcast with us, including Eps.41, Eps.74.5, Eps.80, Eps.81, Eps.82, and Eps.87. We've also been guests on her excellent whiteboard video series "Engineers Unplugged" (here, here, and here). We're still not exactly sure what Matthew Brender does. Something about the intersection of storage technology and hipster culture and a strange fascination with all things downtown Boston. We're pretty sure that none of his enormous hopes and dreams have been crushed by parenthood or corporate bureaucracy - at least not yet!